Quality content for businesses looking to grow their operations with flexible small business funding solutions. Editors note: we’ve received several requests from potential clients recently asking us what a sample invoice would look like. So we thought we’d offer up a post with a free download of a simple invoice template. Invoicing clients requires attention to detail, so you don’t screw up collecting money that is owed to you. It can also be a boring, monotonous, and confusing process. In order to streamline any questions or confusion you might have, we’ve created a simple invoice template that can serve as an example of what your invoices should look like or include. Below is a screenshot of the invoice, and a brief explanation of how to fill everything in, followed by a link to download this for yourself. After you download it, create copies and use it as many times as you want. If we’ve jumped ahead, please check out last week’s blog post about exactly what an invoice is. Anywhere you see text, you can edit. Those areas include your Company Name, the invoice number, date, your address in the upper right hand corner, a space for comments, and item name and description. You can also edit the total quantity, unit price and total due for each line item. Note however since this simple invoice template is in Word, you will need to manually calculate each of these. Again, this is just an example and not the ideal invoice to use. Print to PDF and send electronically, or print and send via mail. Always be sure to number your invoices consecutively. Should the need arise for any questions on your invoicing needs, let us know. We’re happy to help. It’s also best to keep track of everything in an online accounting platform such as Quickbooks. For your free invoice template, download it below by clicking the Simple Invoice Template link below. If you’re a small business owner, you’ve probably received a fax, e-mail or phone call about obtaining a “merchant cash advance”. Merchant cash advances are a form of business funding that should, in theory, fall between a loan and an investment. Because it’s not a loan, there is no “interest” associated with it. Instead there is a fixed payback. The fixed payback is often determined by a “factor rate”, which can be deceiving because A/R factoring is not involved. What follows below is a quick explanation of this funding mechanism and how merchant cash advance rates are calculated. A merchant cash advance is an advance of future business revenues. The funding company will purchase a fixed amount of your future revenues, for lump sum cash up front. A sample deal would be a purchase of the next $13,000 of your revenues in the future, in exchange for $10,000 right now. The funding amounts are largely based on cash flow, like total monthly credit card transaction volume or business bank deposits. Payback would be a fixed % of all future moneys that come in – explained in more detail below. Learn more about the merchant cash advance, also known as cash flow funding. In the above example, the merchant cash advance fees would be 30%. The total repayment on $10,000 would be $13,000. This would be a “factor rate” of 1.30. To calculate the total payback on the funding amount of $10,000, multiply the funded amount by the factor rate ($10,000 x 1.30) to obtain the payback. The payback is often called the purchased amount. Many people tend to annualize the fee as an APR but this is incorrect. First, it is not a loan so calculating an interest rate is inherently faulty. Secondly, because the funding company is only receiving a fixed percentage of all future moneys as repayment on the advance, the length of time they will collect is often unknown. For example, if the funding company says “I will pay you $10,000 right now, in exchange for the next $13,000, and you will pay me back 10% of every credit card swipe, until I get my $13,000, no matter how long it takes”. If tomorrow you have a huge downturn in business and your daily credit card volume drops from $1,000 to $100, the funding company will be taking 10% of $100, not $1,000. Similarly, if your business started to boom and you started to process $2,000 per day in credit cards, the funding company would receive $200 per day. Again, the length of repayment is unknown, so it’s not correct to calculate an APR based on merchant cash advance rates. The reason why is that you don’t know how long it will take to pay off. The payback is called the “factor” rate, which is fixed. The funded amount is the “advanced” amount. Repayment is done by remitting a portion of every sale until the purchased amount is met. The portion of every sale paid back will be either 1) a fixed percentage of your daily credit card revenues, or 2) a fixed dollar amount debited directly out of your bank account. Fees increase the overall merchant cash advance rates the factor rate sticker price. Look for an Addendum or Appendix to the agreement that detail the fees. These are usually buried in the back of the contract. Ask your broker representative or the direct funder what you will be charged for and don’t move forward until you have a clear idea of what the fees are. If you’re working with a broker, look for a fee that says “PFS” or “Professional Services Fee”. This is basically a finders fee and is usually placed on top of the commission the funder is paying the broker. Push back on the fees, they’re often times egregious – especially if your funder is located on Pearl Street or in New Jersey! Editor’s note: this article is for new business owners and tailored to those who are starting to earn revenue from clients. This article is very elementary and does not apply to many business owners! But if you’re just ramping up your business and a client says to you, “invoice me”, it’s probably best to act like you know what you’re talking about and agree that you will. But it begs to question if you’re unfamiliar, what is an invoice? Put more simply, an invoice is the bill you send your customers, requesting that they pay you within a fixed time period, who don’t pay you cash upon the delivery or when you finish your work. An invoice includes information about the service or product delivered, with the due date, preferred or accepted methods of payment, and any special terms regarding payment or discounts. How do I invoice a client? 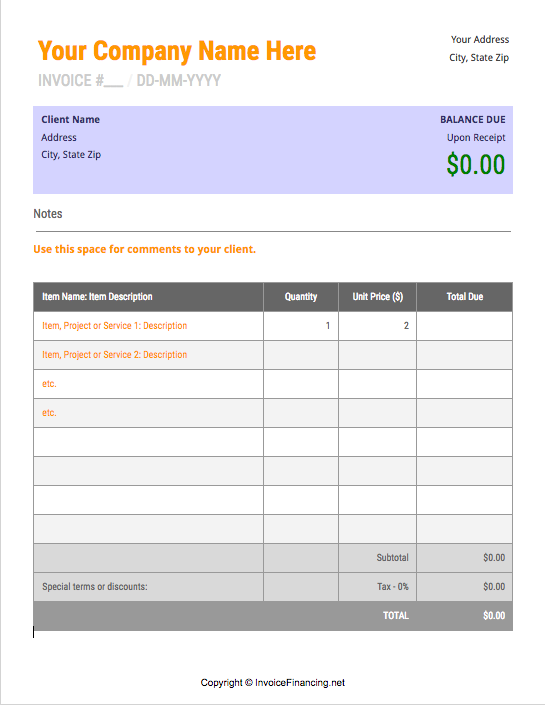 There are many free services online that allow you to invoice a client with a basic invoice template. Ideally, you should keep invoices very simple so they are easy to understand and identify how much is owed and for what. Having an invoice system in place too is very important. This will require that you label invoices consecutively, i.e. Invoice 001, 002, 003, 004. Invoice numbers should be independent of the customer – meaning you can send multiple invoices to a single customer. Keeping track of invoice is extremely important for a few reasons. First is that it will keep you organized. Secondly, you want to have the ability to track invoices and to whom they were sent in the future (especially when closing out the books at year end). Invoices are also known as “accounts receivable”, “A/R”, or simply a “bill”. Once an invoice is issued to your client, you need to increase the Accounts Receivable account in your accounting system with a simple accounts receivable journal entry. 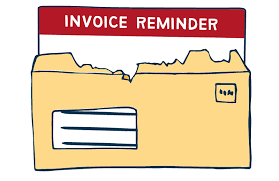 And whatever you do… don’t forget to invoice your clients! Many people who start a business generally are aware of the fact that there are three main ways to raise capital. The first is so obtain money from an investor. The second is to obtain money from a bank (i.e. a loan), and the third is to do it themselves by investing their own money. However depending on the type of business you have, particularly what kind of customers you have and how you bill them, factoring invoices may be the best suited option. Invoices, also known as accounts receivable, are created when a business bills its customer and says “pay me later”. Invoice factoring is when a business sells those unpaid invoices to a factoring company in exchange for up front capital. Invoices are sold at a discount and usually the business obtains 80% of the value. After the business’s customer pays the factoring company the value of the invoice, the 20% rebate is given to the client, less the factor fee. 1. Match the timing of income and expenses. Despite a common misperception that invoice factoring signals a company is in trouble, in most cases it’s actually quite the opposite. Rapidly growing businesses need capital to continue to take on new business. Therefore financing invoices is a great way to match income and expenses, so a business has the readily available capital it needs to take on a new job. 2. Bridge to your busy season. Many businesses are cyclical and have higher revenue during their busy season. To ramp up for busy season, a business will need capital on hand. Invoice factoring is a a viable solution to closing short-term cash flow gaps. 3. Cheaper than selling equity. Factoring invoices is a cheaper way to raise money than selling shares of your company to an investor. If you sell shares, you forever give up a percentage of future profits to the investor. If you plan to be in business for a while, that could become very costly as you grow to higher revenue levels. At 1-3% per month, factoring is way cheaper. 4. Safer than a loan. A true factoring product is what’s known as “non-recourse factoring“, meaning the factoring company takes the risk that your customer’s don’t pay. These deals should never have a personal guarantee involved. This differs from a bank loan, that has liability attached to it if your client’s don’t pay, often times with a personal guarantee. 5. Fast time to funding. The typical turn around time from your first conversation with a factor until you receive funds is 3-5 days, far faster than a bank. Despite the many benefits of invoice financing, there are some negative aspects associated with it. 1. More expensive than a loan. Factoring companies assume the risk that your customer don’t pay. Because of this increased risk, the price of factoring invoices is higher. You have to ask yourself how much risk you want to take. If you really want the cheapest financing deal out there, you need to be very confident in your customers paying and ok with taking that risk that you will be held liable if they don’t. In that case, look into invoice financing. However, if you absolutely do not want to take that risk, invoice factoring is for you. 2. It could impair your ability to obtain a bank loan. Factoring companies will take a “security interest” in the assets of your business. At the very least, they’ll take a security interest in the current and future receivables of your business. Therefore it’s important to have the discussion with your factor, to ask if they will “subordinate” if they obtain a pre-approval for bank debt. Most factors will, however you don’t want to get set-up with a factoring facility to satisfy a short term capital need, at the cost of a better long-term solution. In order to make the best decision for your business, you must thoroughly weigh the pros and cons before proceeding with such an important decision. Contact us today for a free assessment of your financing needs and business strategies to see if factoring invoices is a good fit for you and your business. If you’re looking to sell your invoices as a way of raising capital, it’s important to understand the differences between recourse and non-recourse deals. Essentially, recourse factoring means you (or your business) is on the hook if your customers don’t pay the invoices you sold to the factoring company, and non-recourse factoring means you’re not on the hook. Think of non-recourse deals as “no strings attached” financing – the factoring company completely assumes the risk that the invoice won’t be paid by your customer. Obviously, there are many benefits to obtaining non-recourse accounts receivable financing. The credit/collection risk being assumed by the factoring company is the greatest benefit. So while you’re out looking for the best deal, be sure to reference this article. Despite the title, instead of providing you with a non-recourse factoring agreement sample, we thought we’d provide you with language that raises red flags – language that signals a deal is recourse. Since recourse deals have increased potential liability associated with them, it’s important you know how to identify the differences. But please don’t get us wrong here, recourse deals aren’t necessarily bad. Because the factoring company doesn’t assume as much risk, the fees are usually lower. But if you’re not willing to assume the risk of a recourse deal, you need to know how to identify one. Notice how there is zero language about “with recourse” in the second quotation. Also, for purposes of a factoring contract, “buyer” and “purchaser” mean the same thing. The word and specific language of each clause depend on the factoring company’s attorney. Sometimes, not but always, factoring companies will include a “repurchase” clause in a factoring contract. These clauses govern a repurchase of the invoice by your company, from the factoring company. Because factoring involves the “purchase and sale” of invoices, where your business sells invoices to the factoring company, a repurchase means you buy them back. This could happen for any number of reasons, like the invoice being outstanding for more than 90 days. Again however, it’s important to understand the language. Purchaser may require that Seller repurchase, on demand, or, at Purchaser’s option, by Purchaser’s charge to the Reserve Account: Any Purchased Account, the payment of which has been disputed by the Payor; Any Purchased Account owing from an Account Debtor or Payor which (a) in Purchaser’s reasonable credit judgment has become insolvent or (b) has indicated an inability or unwillingness to pay the Purchased Account when due; Any Purchased Account that remains unpaid beyond the Late Payment Date. Notice that in the above clause, the factoring company (the Purchaser) can force you buy back the invoice (the “Purchased Account”) on demand – even if your client has become insolvent, refuses to pay, or pays late. We can’t say it loud enough – that is NOT a non-recourse deal! Insolvency by your customer, late payment and refusal to pay are exactly the types of risks assumed by the factoring company in a true non-recourse deal. Also note that in the above clause, the factoring company might not make you cough up the cash; rather, they will “charge” or debit your reserve account. Meaning, any money of yours the factoring company is holding in reserve, they will take for themselves. Effectively, you still have to pay them. The language here indicates that the option remains with the you, the original seller. With this language, the factoring company cannot simply “put” the receivable back to you if the invoice doesn’t get paid. The language of the clause is silent on instances where you would have to repay. Basically the risks discussed above – refusal to pay, late payment or insolvency of your clients – are being assumed by the factoring company. Look for the recourse language and the repurchase language – that’s it. Arguably these are the two most important that distinguish non-recourse from recourse. The recourse language will almost always appear in the first or second clause of the contract. The repurchase clause, whether recourse or non-recourse, will almost always have a calculation of the repurchase amount associated with it. Read this carefully. 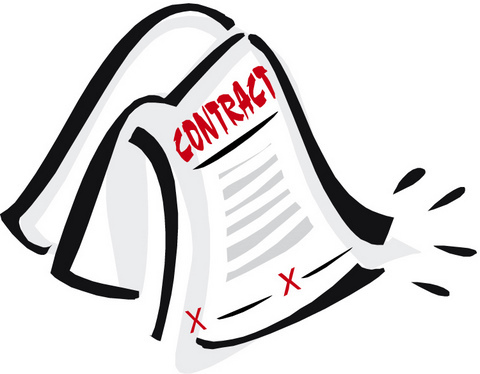 IMPORTANT – Some contracts might not have recourse language in the very beginning, making it appear to be a non recourse deal. However, the repurchase clause might give the factoring company the ability to force you to repurchase the account if the invoice doesn’t pay. This is a nifty way for factoring companies to “disguise” a recourse deal as non recourse. And lastly, contact your attorney to thoroughly comb through any contract before signing away. We hope you found this non recourse factoring agreement sample helpful. As always, don’t hesitate to reach out to us for assistance securing you, or reviewing, factoring deals on your behalf. DISCLAIMER: this article is not intended as legal advice. This article is is merely an informative, hypothetical article with examples about recourse language versus a non recourse factoring agreement sample. We advise that before you sign any deal, you take this article with a grain of salt, reference your attorney, and make sure you understand the language even after your attorney has explained it to you. He definitely beat this like a dead horse but it was a good lesson because I never forgot. And given that the two are different, so is the accounting and reporting. If you’re new to being in business for yourself, or just starting to extend favorable payment terms to clients, you may find this article helpful. After you complete a job and have been paid for it, you have to account for that transactions by booking the sale. This is simple enough – you simply will recognize an increase in cash for a corresponding increase in sales. You saw the cash come in, and if you have an increase in cash the only other possible increase is that of sales. But how do you account for the transactions or jobs you’ve completed, but have yet to be paid on? How do you account for those transactions in your Quickbooks, Xero or other accounting software? Below are some basic accounts receivable journal entry examples and the rationale behind them. But first, let’s cover the basics. When you sell a product or service for cash, credit card or check (i.e. payment now), you’ll generally book it as a cash account. This journal entry is simple, debit “cash” and credit “sales” or revenue. Rationale: a Debit (Dr.) to an asset account like “Cash” means an increase, and a credit to an income statement account like “Sales” is an increase. In order to recognize the cash received for the new sale, you would debit cash (increase) and credit Sales (another increase). This keeps debits and credits equal in size. Remember, for debits must always equal credits! This is the first and last journal entry you must do for a cash sale. But that’s not the case with accounts receivable journal entries (note, it’s not just an entry but more than one). Simple enough. Notice how the second A/R journal entry closes out the Accounts Receivable – Client 1 account. In the first entry, there was a $10,000 increase, however when the cash was collected, we increased cash $10,000 and closed out the corresponding A/R account. If you’re current using invoice factoring, the journal entries will be slightly different. Please contact us at info [at] invoicefinancing [dot] net for assistance with how to account for those transactions. 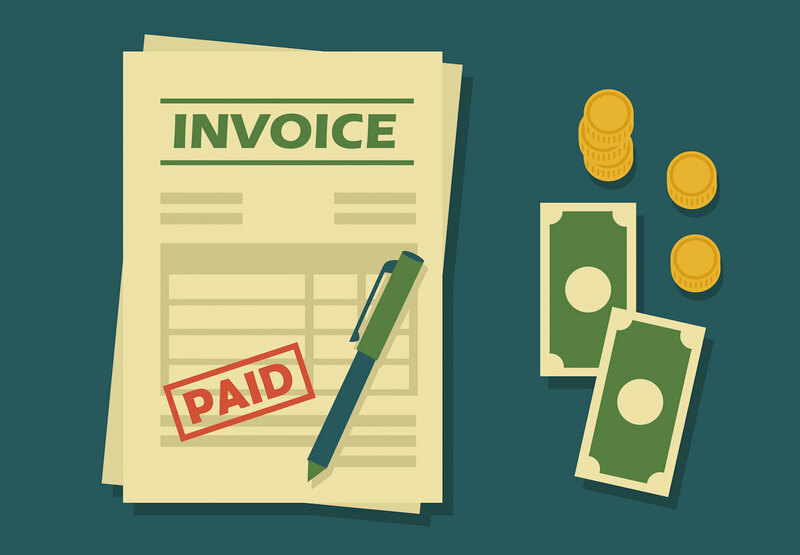 Invoice Financing vs. Factoring: Which Is Best For My Business? If you’ve done enough research, you’ve probably come by many articles that say “invoice factoring” and “invoice financing”. On the surface they may appear to be the same product but they’re quite different. However, before we get into the differences it should be noted that they do serve the same purpose. Both invoice factoring and invoice financing offer a “liquidity” source for businesses. Meaning, they can us their unpaid invoices as source of immediate cash. Invoices (a.k.a. “accounts receivable”, A/R, or simply “receivables”) have a future value in that they represent a future cash receipt from a customer or client. Your business provides services or product, and then “invoices” the client for their payment at a later date. Invoice financing and factoring allow businesses to tap into that future payment today. In this regard, they are the same. As you will learn below however, they are two different products and it’s important that you understand how. The 30,000 foot view here is that invoice financing is a loan product, whereas invoice factoring is the sale of an asset (receivables) off of your balance sheet. With invoice financing, the invoices are used as “collateral” for a revolving line of credit. The receivables belong to the business owner. However with factoring, the invoices are “sold” to the factoring company; the receivables belong to the factoring company. Here is a high level comparison how both products differ, with a summary of more similarities at the very end. With invoice financing, the business has access to a revolving line of credit, meaning the money can be drawn and paid back on an as needed basis. A borrowing base is established, and the receivables act as collateral. The borrowing base is essentially the assets available to be leveraged for a business, and then the credit limit is a % of the borrowing base. For example, if the only non-cash assets a company has are $100,000 in receivables, the borrowing base will take into consideration this $100,000, plus other factors, to determine the credit limit the business qualifies for. Typically, the end number is something less than $100,000 and in rare instances, may be more. Because the line of credit is actually a loan, there is a personal guarantee and interest that amounts to 5-10% per year. Additionally, if things were to go bad, the business would be liable as well so therefore the deal would be “recourse”. Requiring a personal guarantee and recourse to the business is safer for a financing company, because they have more assets to procure in the event something goes wrong (i.e. “strings attached”). Therefore, the APR is much better than with invoice factoring. With invoice factoring, the business receives advances against their unpaid ad revenues of up to 80%. So for example, if a company has $100,000 in receivables, they can get up to $80,000 advanced up to the time the receivables pay. These advances are considered part of the purchase price. The remainder of the purchase price is paid when the receivables are paid. True invoice factoring deals rarely have a personal guarantee associated with them. If you come across an A/R factoring deal with a personal guarantee (or a “confession of judgment” / “cognovit note”) attached to it, be very, very suspicious! Lastly, most pure receivables factoring deals are non-recourse, meaning the factoring company assumes all of the risk that the receivables won’t pay. However some deals are recourse to the business only, which means the business is liable to make up for any non-payments (but usually, not the owner). Because of the increased risk assumed by the factoring companies with a pure factoring deal, the rates are higher. Many business owners who don’t want to assume the risk of non-payment find that a pure accounts receivable factoring facility is a better fit for them. In sum, a “pure” A/R factoring facility is 80% advance, non-recourse to the business and no personal guarantee. The mechanics of how it works may be slightly different, but the essence of a factoring facility include (or don’t include) those three items. Almost all invoice funding deals require a lockbox, UCC acknowledgment/assignment (notification), and release of a reserve. You will often hear this term if you are shopping around for liquidity against your invoices. A lockbox is a bank account owned by the financing company that is used to collect receipt of the invoices. Sometimes it is in the name of your business, i.e. if your business and bank account names are “Joe’s Roofing” the lockbox might be “Joe’s Roofing Collections”. Most times however the lockbox remains in the name of the funding company. This method is much safer for financing company because they collect directly from your clients and don’t have to chase you down for the money. Because lockbox deals require your customers to pay a new bank account, they require “notification”. Before any type of factoring deal can go through, the factor or bank will require that you send a signed letter of acknowledgment and assignment to each of your customers, with directions on how to pay the factoring company. The acknowledgment / assignment letters are written pursuant to the United Commercial Code, the law in America governing secured transactions of this sort. The letter basically says, “I sold (or borrowed against) my unpaid invoices that I’ve issued to you, and they now belong to (or are being held as collateral by) someone else, therefore please pay them to the following bank account.” UCC notification may be an issue for some companies who don’t want their clients to know about their financing devices. If that’s a problem you face, you should look for a “non-notification” product when shopping around. When the invoices get paid by your customers into the lockbox, the financing company will be holding some of your money. Think about it – you never received the $100,000 of unpaid invoices with your line of credit or factoring facility. You only received 50-80% of it, or something less than $100,000. So when the invoices get paid, the financing company receives the balance of the purchase price, and releases that to you minus their fee. On a factoring facility with an 80% advance, here is a quick math breakdown. You receive 80% of $100,000 up front right now ($80,000), and in 30 days when the invoice gets paid, you receive the remaining 20% ($20,000) minus the factoring fee (1-3% per month). So on a deal with a 1% factoring fee, you would pay 1% of $100,000. The factoring company is paying $99,000 for it ($80,000 up front, then $20,000 minus $1,000 = $19,000 later). Which Is Better For My Business? It depends on the quality of your deal. If you personally have bad credit, factoring may be your only option. If you can afford to pay 1-3% per month and don’t want to personally guarantee the deal, go with factoring. If you have solid credit / business history, and want a cheap deal, go with an invoice financing. Again, it depends on the quality of your deal and your overall risk tolerance. Do you want strings attached for a cheaper price, or not? Debt Financing vs. Equity: Which Is Best For Your Business? What is a Merchant Cash Advance (“MCA”)? InvoiceFinancing.net was founded by a team of factoring industry veterans and talented entrepreneurs. Our mission is to secure you the best invoice financing deal on the street, with simplicity, transparency and timeliness. Our service is always free, and we will never sell your information. We are not a lead generation company. Congrats! You Qualify for Invoice Factoring! Congrats! You Qualify for a Cash Flow Loan!